Although I missed this trip, I was feeling well enough to go to Sedona, Arizona in August, 2006. 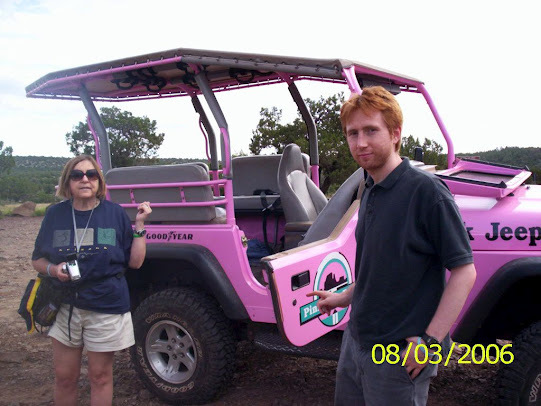 I convinced everyone that I was well enough to go off-road in a pink jeep, DH wanted to report me to my surgeon but I survived without to much pain and posed for the header image. In 2009, I figured I have “extra years” since I survived the cancer and I wanted to do something kinda scary, yet fun. So, somehow, I decided on ziplining. Tom wouldn’t go with me but Michael would so I set this up almost as soon as we booked a Caribbean cruise to replace the Cushie Cruise to Bermuda. I got out of the hospital on the day that they left for the cruise and realized that I wouldn’t have been much (ANY!) fun and I wouldn’t have had any. After that, no more problems with breaking! Summary: In this study, researchers assessed mortality in patients with hypopituitarism with and without long-term growth hormone (GH) replacement therapy (GHRT). Theirs is the first study to report a reduced mortality in non-functioning pituitary adenoma (NFPA) patients with long-term GHRT compared with both the general population and NFPA patients who have not received GHRT, despite a more severe hypopituitarism. Further, researchers found that mortality due to circulatory diseases was not increased in NFPA patients regardless of GHRT. Finally, they found that death due to malignant tumors was decreased in the GHRT-group. To eliminate the influence of the etiology of hypopituitarism on mortality, researchers included only patients with NFPA were studied. Using the Swedish National Patient Registry, researchers identified NFPA patients within the Sahlgrenska University Hospital’s catchment-area (1.5 million inhabitants), and retrospectively reviewed records of all identified NFPA patients from 1987 to 2011. Standardized mortality ratios (SMRs) with 95% confidence intervals (reference: Swedish population) were calculated and cox-regression analyses were used to identify predictors for mortality. Researchers identified 437 patients with NFPA, of whom 435 (99%) had complete records and were included in the study. They observed that GHRT had been used for at least 1 year by 188 patients (132 men, 56 women), while 247 patients had not been treated with GHRT (148 men, 99 women). Mean (±SD) age at diagnosis was lower (P<0.001) in the GHRT-group (54.2±11.7) compared to the non-GHRT-group (63.8±15.6). Mean duration of GHRT was 10.9 (6.7) years, and mean follow-up time in the non-GHRT-group was 7.0 (5.4) years. In the GHRT-group, ACTH deficiency, gonadotropic deficiency and thyrotrophic deficiency were more frequent (71%, 74% and 93%, respectively) compared with the non-GHRT-group (38%, 34% and 50%). The total number of events/deaths in the study was 83. In the GHRT group, SMR was 0.49 (0.27-0.80, P=0.002) compared with 0.98 (0.76-1.24;P=0.94) in the non-GHRT-group; SMR was lower in the GHRT-group compared to the non-GHRT-group (P=0.02). Researchers found that Cox-regression analyses identified GHRT (P=0.01) and younger age at diagnosis (P<0.0001) as predictors of decreased mortality. They also found that cause-specific mortality due to circulatory diseases was not increased (GHRT-group, SMR 0.62; 0.25-1.28; Non-GHRT-group, SMR 0.96; 0.65-1.36). SMR for malignant tumors was reduced in the GHRT-group (SMR 0.19; 0.02-0.68; P=0.003), and as expected in the non-GHRT-group (SMR 0.74; 0.37-1.31; P=0.37).